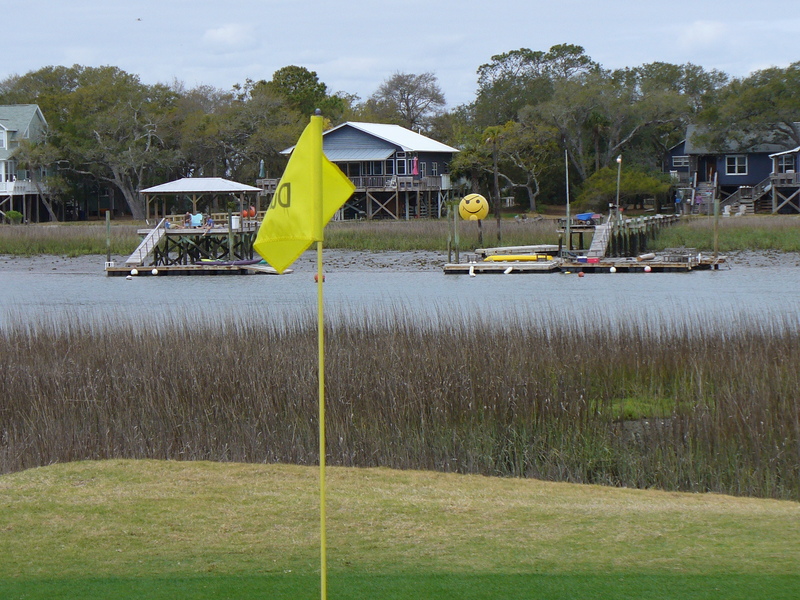 When people think “South Carolina golf,” they tend to think of Myrtle Beach. But arriving in the Charleston airport, you’ll see the Golden Bear Grill, a pretty solid clue that golf is woven just as deeply into the fabric of the state’s cultural center. There are numerous courses in and around Charleston, with arguably the gold-standard Low Country golf resort about a 40-minute drive on the Isle of Palms. The island retains its idyllic feel, despite massive development of rental and resort properties. 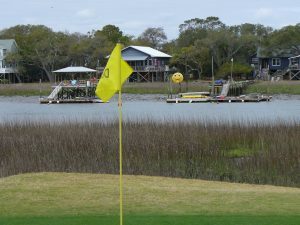 The most expansive of these properties is Wild Dunes Resort, which encompasses acres of houses, condos, a hotel, and dozens of other facilities, including two highly regarded golf courses, The Links Course and The Harbor Course. What is remarkable about Wild Dunes is, despite its size and the transience of some of its inhabitants (i.e., vacationers), it retains the atmosphere of an intimate community. 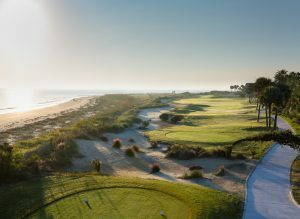 I was fortunate enough to participate in the 35th edition of the Wild Dunes Club Car Pro-Am and more than anything, came away with a sense of the camaraderie and friendship associated with these golf courses, despite being an outsider. But before I regale you with stories from the Pro-Am experience (and our 12th-palce team finish), a bit more about the resort and courses. Both of the Wild Dunes courses are 1980s Tom Fazio designs. The Links Course, dating from 1980, is Fazio’s first solo effort, and the 1985 Harbor Course is an unofficial collaboration between Fazio and the late, great Mike Strantz. The Links Course was famed for its final two closing holes – a long, difficult par 4 and a longer, more difficult par 5 – both of which ran directly along the beach and boasted infinite views out over the Atlantic. 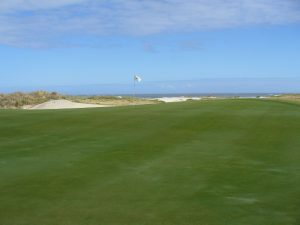 The 17th Hole of The Links Course at Wild Dunes runs along the Atlantic. When Hurricane Hugo zeroed in on the Isle of Palms some years ago, most of that 18th hole disappeared into the ocean. So the closer was rebuilt as a par 3, the course shrunk from around 6,800 yards to 6,500, and par changed from 72 to 70. The Links Course underwent a substantial renovation by Fazio’s firm a few years ago, and it is, from what I gathered at the Pro-Am, the more popular course among the locals. 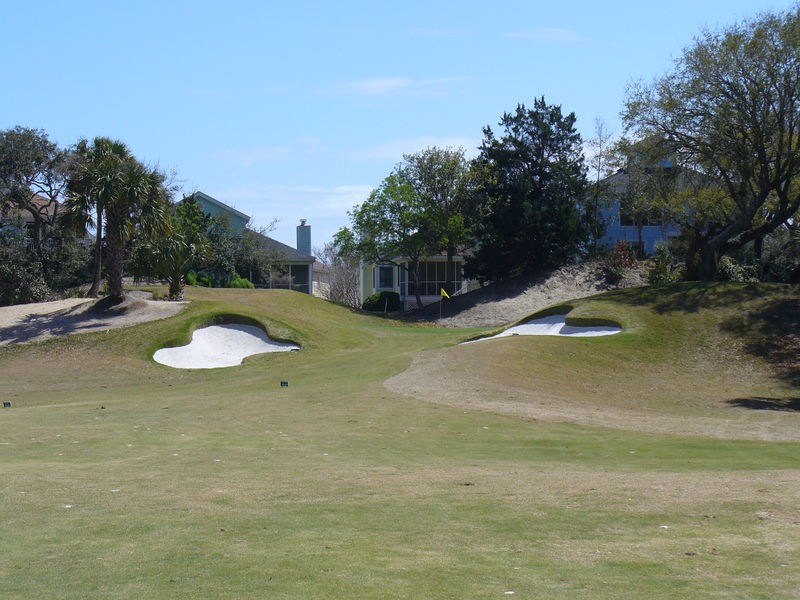 The most obvious improvements on The Links are vastly expanded greens and rebuilt white-sand bunkers. These new greens, feature increased undulations and wider variety of pin positions, and the surrounding turf is a newer variety of Bermuda grass, which is not nearly as “grabby” or “sticky” as you’ll find on The Harbor Course. 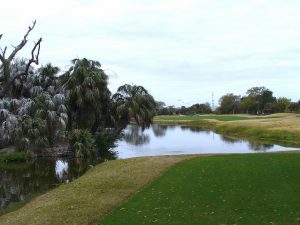 The 6,359-yard, par-70 Harbor Course has numerous holes with views of the Intracoastal Waterway, including the stretch from holes 9-11, which are right on the water. 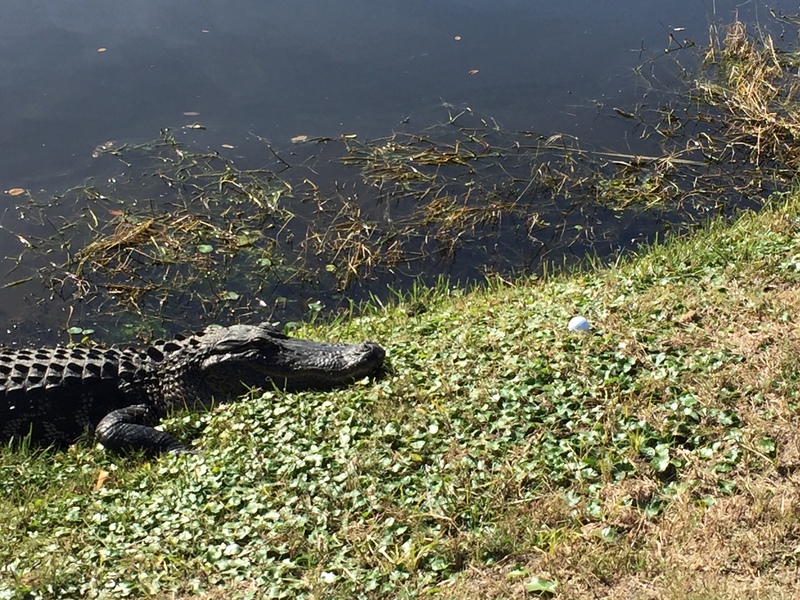 In fact, water or marshland come into play on every hole of the Harbor Course, and as such, can be either a straight-hitter’s paradise or a wayward golfer’s nightmare. The Links Course is more forgiving, but still has plenty of water and OB to cause trouble if your directional control is too far off. I was fortunate to play both courses with our Pro-Am team pro, Trey Sanderson. Trey’s a former mini-tour player and present-day TaylorMade rep and fitter. We were also joined by Mike Bright, 1980s-era PGA Tour player whose laser-like 5-yard draw found the dead center of every single fairway. 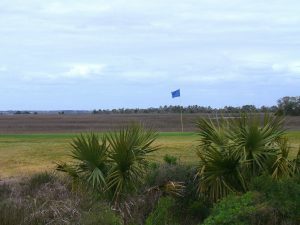 Between the two of them, we were privy to over three decades of living, working, and golfing in the Low Country, in particular in connection to Wild Dunes. 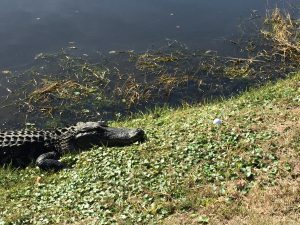 So when Sanderson said, “These are two of the best courses in the area. No doubt,” we had no reason to doubt his assessment. In addition, because both courses are right at sea level, they play longer than the scorecards suggest. So despite the presence of big-hitting pros, the Pro-Am was contested from the white tees on both courses, around 6,000 yards. “At sea-level, and with the ocean winds, the course plays a lot longer than you think,” Bright reminded us at the outset. Aside from the cramped 351-yard 10th hole – where a combination of overly-rumpled fairway, odd bunkering, and semi-blind landing areas make club choice on the tee basically impossible – there’s not a bad hole on The Links Course. The round culminates at the 412-yard 17th and the new 185-yard 18th, though, with the waves crashing on the beach and the prevailing ocean winds turning club selection into a crap shoot. Greens on The Harbor Course are scheduled to be expanded by Fazio’s Firm, but as of yet are still tiny – difficult to hit and quick as lightning. 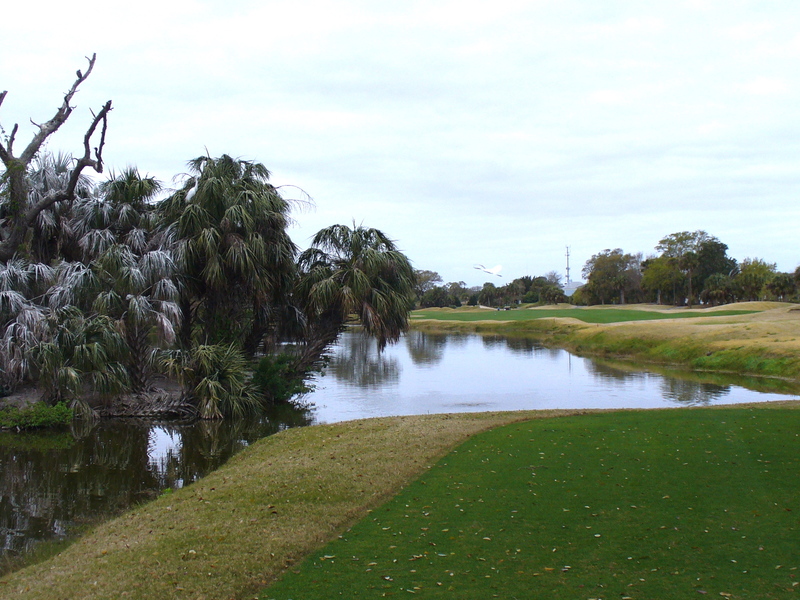 The stretch of holes, 9-11 along the Intracoastal, is really lovely and very fun and will probably be the holes you remember most. Course knowledge is critical here, as there are cross-hazards, hidden water, and tricky winds. The Links Course has some unexpected elevation changes, both from tee to green and fairway to green, on a few holes. The approach to the elevated green on the par-4 11th is shielded by mounding, and the tee box of the par-3 12th is perched a few dozen feet above the level of the green, making club selection tricky. As for the greens on both tracks, we tended to over-read putts on the Harbor Course all day, and under-read putts on The Links. 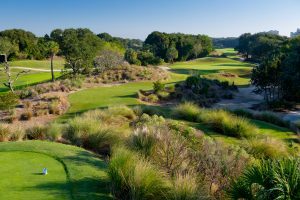 In short, both The Links and The Harbor Courses at Wild Dunes Resort are quintessential low-country tests: fast, firm greens, lush palm trees full of exotic birds, and plenty of water hazards full of gators (do NOT stick your hand into the ponds to retrieve balls!). Rates run from $95-$185 (with cart), depending on time of day/week and whether or not you’re staying at the resort. The low end of this range is very reasonable; the high end is a bit of a stretch. As noted already, Wild Dunes is an expansive, multi-use resort. The centerpiece is a luxury hotel overlooking the ocean, in which you’ll find Coastal Provisions, the resort’s premier dining establishment. The restaurant features classic Low Country fare with an international flare. Numerous local craft brews are on tap as well. A new hotel is being built on-property, too, which will be double the size of the current hotel. 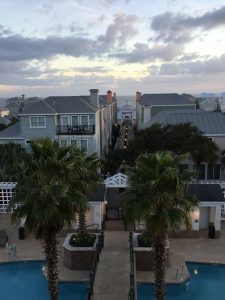 Isle of Palms may be a tourist destination today, but you can still sense the quaint Low Country atmosphere and history, and it retains the feel of a small, unassuming community. It was under a tree by the 14th tee of The Links Course where Edgar Allen Poe sat and wrote many of his now-classic stories. And the house just left of the 16th tee of The Harbor Course used to be rented out each summer by the late, great Robin Williams. In fact, you never quite know whom you’ll run into at Wild Dunes – PGA pros, actors, writers, business moguls. It seemed everyone at the Pro-Am had a fascinating story to tell. Perhaps all the amazing food and drink provided at the event had something to do with heightening the interest of those stories. Each day, the members of the 60 teams were treated to drinks on the course and some of the best “turn” food I’ve ever tasted. James and Josh from the Mermaid Island Grill in Holden Beach, NC, come down each year for the event to serve up gyros and the absolute best French fries on the planet. (The secret is in the potato variety and a double-frying technique, both of which I swore not to divulge.) After play both evenings, buffet dinners and drinks were also served, along with hand-rolled cigars by Cigar Row Events. 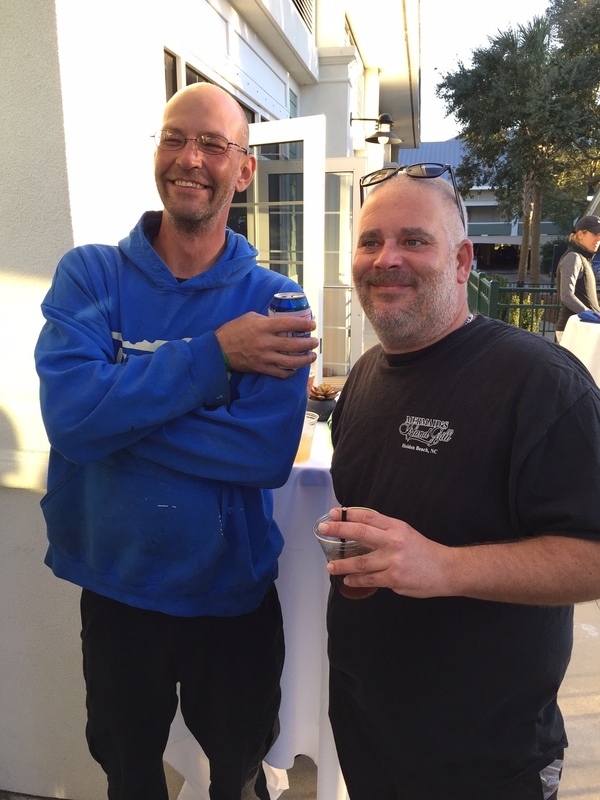 James & Josh spoiled the Pro-Am with delicious gyros & their signature fries. 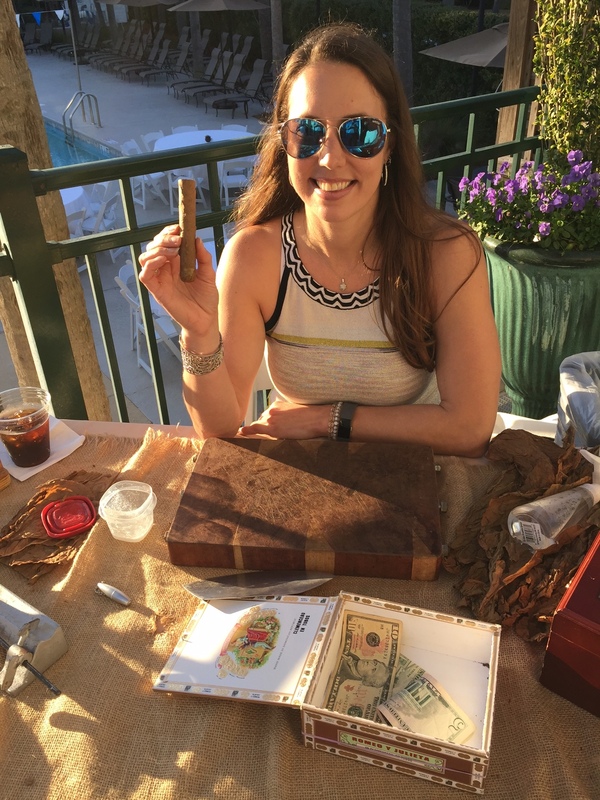 Cigar Row Events provided Pro-Am participants with hand-rolled smokes. At the end of those two days, I found myself thinking how lovely it would be to live here permanently – or even just to visit once or twice a year to get a taste of the local charm, world-class golf, food, drink, and miles of sandy beaches all on offer at Wild Dunes Resort.